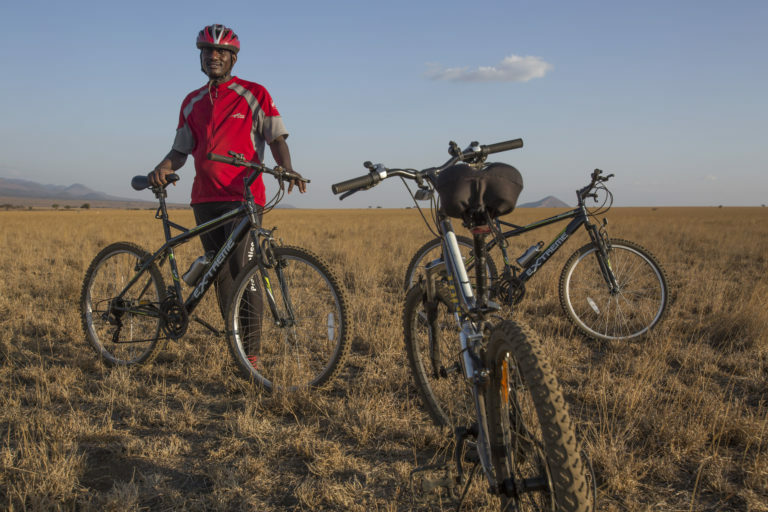 Being an activity guide at ol Donyo Lodge, I was eager to do a cross country mountain bike safari. On the 15th May 2017, the Ride For Lions event started and everything was set in place. Some of the crew left to Amboselli as the starting point, others spent some time at the lodge. I went out with some guests for a drive to decide if we were going to bike ride to prepare for the next day start of the Ride For Lions. The guests were amazed at the beauty of the landscape and couldn’t resist. 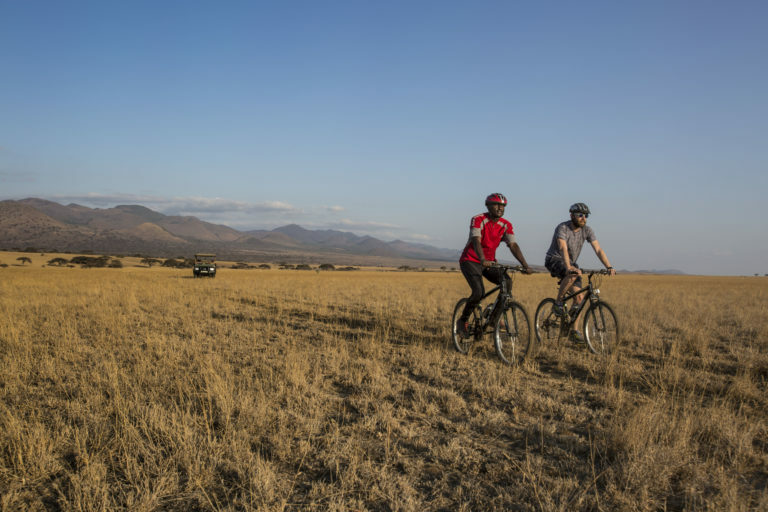 We hopped on to our bikes and rode off towards the ol Donyo Lodge airstrip. We then carried on to other beautiful areas until we reached the large rock koppies, by now having done about 10kms. The ride was fun, and the vast open plains created a perfect scene. The mountain bike that I am used to is one where you have the normal pedals allowing your feet to be loose (this is all I know when it comes to bicycles). 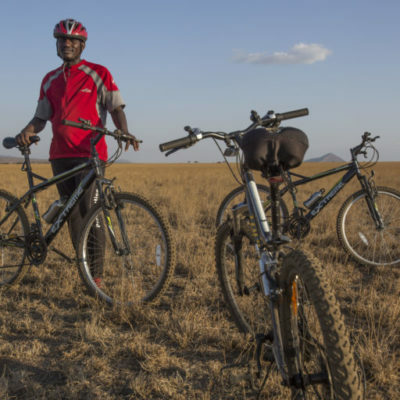 When we reached the rock koppies I realised I had a flat tyre, so I had no option but to use one of the guest’s mountain bikes to allow me to cycle back to the game drive vehicle which we had left at our starting point in order to retrieve a spare bicycle. One kind guest gave me their bicycle but looking at the pedals they looked very strange to me, very small and pointy. I asked them to please explain to me what these are. They said they are called cleats and you need special shoes to use them. I was in a rush and got going with their funny shoes and new pedals. Whilst on my way back to the car I had a sudden urge to pee. I tried to remove my feet from the cleats but found this was not possible for some unknown reason. I decided to hold the urge and carry on. The land in which we were riding is Masaai land and so I came across a herd of cattle in my way. I managed to whistle and get them to move out the way, all the while slowing down whilst dodging the creatures and finding that I was still not able to remove my feet from these strange contraptions. I almost fell. After this I could now see my vehicle. I had now realised that there was an issue in getting my feet loose from peddles and was busy calculating in my head how I was going to do this. I decided that I had to extricate myself in my own style. I decided to ride close to the car then quickly hold on sides of the roof bars. But the challenge remained as to how to release my shoes… It took me some time to do this. The bike was also very high, so it was difficult for me to bend down and release my feet. I finally managed to remove my feet from the shoes themselves – leaving them still attached to the peddles. I was free! Climbing into the car, now with only socks on, I drove back to my guests. I apologised for my delay and had to explain what I had just been through. On telling the story the guests just burst into laughter and then showed me how to release the shoe. After having driven back to ol Donyo Lodge the story naturally spread to everyone who were there for the Ride For Lions event. Everyone was laughing so hard, even one of the event organisers said that this story will be the highlight of his trip. 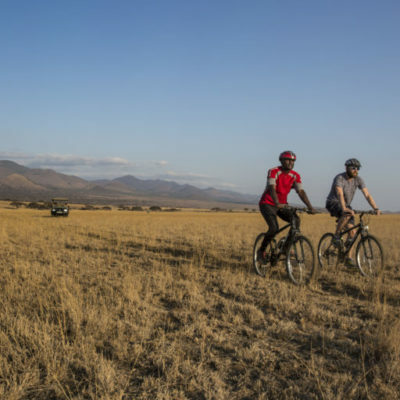 Ultimately after having participated in the 2017 Ride for Lions, I realised how exercises is so good for your body and also how much more energy you get when you regularly cycle. So apart from my initial adventure of learning how to release feet from cleats, I have since maintained my cycling and look forward to the next Ride For Lions this year in May. Thank you, Great Plains Conservation, for this opportunity.